↑ Based on the population in 2014. ↑ 12 founding members drafted the Convention for the Establishment of a European Organization for Nuclear Research which entered into force on 29 ستمبر 1954. 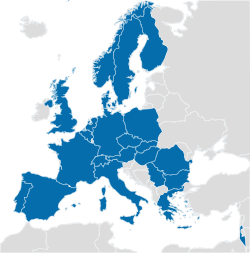 ↑ Acceded members become CERN member states by ratifying the CERN convention. ↑ Additional contribution from Candidates for Accession and Associate Member States. CERN member states: 21 c.
Accession in progress: 2 c.
Associate members and Candidates: 4 c.
اردن - 12 جون 2003. MoU with Jordan and SESAME، in preparation of a cooperation agreement signed in 2004. جنوبی کوریا – 25 اکتوبر 2006. ↑ Rahman, Fazlur. (2013-11-11) Israel مئی become first non-European member of nuclear research group CERN – Diplomacy and Defense Israel News۔ Haaretz. Retrieved on 2014-04-28. ↑ Quevedo، Fernando (جولائی 2013). "The Importance of International Research Institutions for Science Diplomacy". Science & Diplomacy 2 (3). http://www.sciencediplomacy.org/perspective/2013/importance-international-research-institutions-for-science-diplomacy.